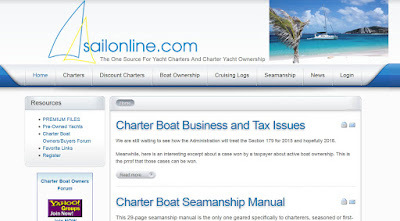 If you are curious about buying a used charter boat or renting out your boat as a charter or any other scenario regarding charter boats, Sailonline.com is a great resource to learn about the details of this industry. Jan. 2018...safe arrival in La Paz! I'm a biologist and began sailing as a diversion from laboratory work up in Seattle. I didn't intend for boats to hijack my life, but that's what happened. I've since taken my 1976 Newport 30 sailboat into most of the nooks and crannies in between Mexico and the glaciers in Alaska. Somewhere along the way I met Jessica. She's a marine biologist. More importantly, she loves the boat. We now keep our boat in La Paz, Mexico. We island hop in the Sea of Cortez when we can get away from work. Solar panels for boats: an easy installation guide. Anchoring in British Columbia can be tricky...it's good to stay insured. Click photo to read my annual insurance review. I now update this page every year. People from all over send me comments regarding their boat insurance experience. I try to shed light on policy features, tips to get lower premiums and overall boat insurance cost. If you have any feedback, please leave a comment on one of my posts. Here's a link to my 2018 article reviewing the best boat insurance providers..
For the next year, Jessica and I will be sailing our Newport 30 along the Pacific coast of Mexico. The boat will be on anchor and off the grid. I want to maintain a reliable power supply, so I've been experimenting with different generators. I just wrote up this 2018 review of the best solar panel generators. Hopefully the article informs other folks that are also thinking about a back-up power supply. Jessica sanding down our teak. I wrote this step by step tutorial that shows boaters how to care for the external wood on their vessel. My approach won't break the bank and won't take all your time. Follow the Captain's log. Keep up with our modest budget Mexican cruise! How to install a Dickinson Marine Heater - an easy guide. Captain Ray's boat names for all the classic boater types. We spend far too much time hanging around marinas. This means I see all the typical boating personalities. I decided to organize a page of funny boat names by the typical boating types. Click image above and enjoy! Sailing to Catalina Island with my brass anchor mug. Copyright protected 2015. Simple theme. Powered by Blogger.